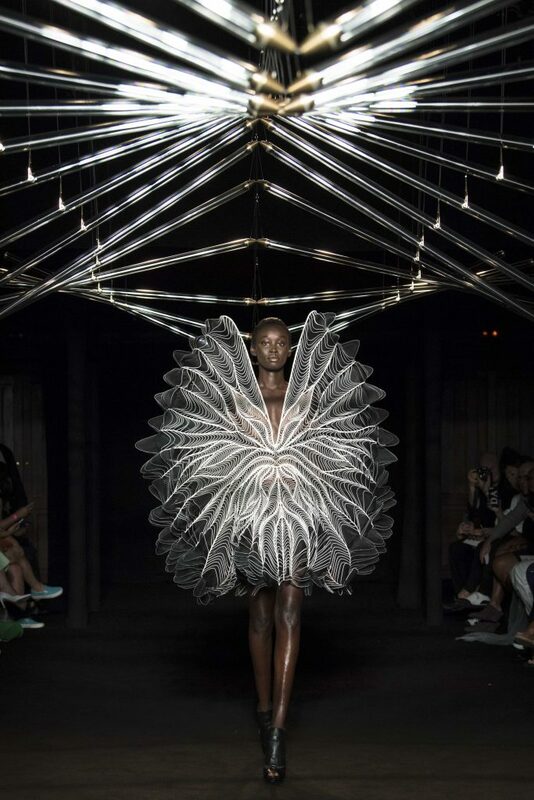 For her latest Haute Couture collection SYNTOPIA, van Herpen has collaborated with the artists Lonneke Gordijn and Ralph Nauta of Studio Drift, whose biomimic art works translate natural processes by breathing life into delicate immersive sculptures through movement. The presentation took place this week on July 2nd, 2018 at Le Trianon in Paris. In 20 Steps — Studio Drift’s site-specific installation accompanying van Herpen’s SYNTOPIA collection in a tribute to evolution and the ultimate human desire to be able to fly. The moving wings of delicate glass represent the constructive steps of continuous improvement. The vivacious glass bird flows in symbiosis with the models while they move over the runway, their delicate interaction emphasises the fragility of new worlds living and soaring together. 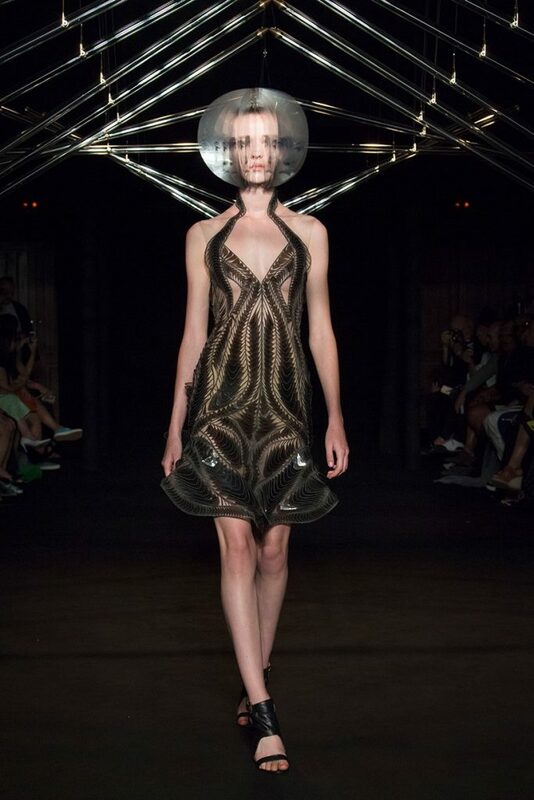 In this collection van Herpen explores the new worlds that arise within synthetic biology and the intertwining relationships between the organic and the inorganic. SYNTOPIA acknowledges the current scientific shift in which biology converges with technology and visualizes the fragility and power within. The ‘Inside a second’ technique translates the artistry of Studio Drift and the chronophotographic lines of birdflight into thousands of two-toned transparent organza layers that are lasercut and heatbonded with mylar and cotton, that drape like time-lapse motion. The mini ‘Mimesis’ corset dresses are made from bird’s soundwave patterns that are lasercut of mylar, black cotton, red organza and transparent black acrylic sheets, layering the silk and acrylic like a feather’s architecture. Studio Drift is represented by Pace Gallery and works with Future\Pace, an innovative cultural partnership that commissions and delivers world-class multidisciplinary artistic projects in the urban landscape. as one of the most influential things in my life has been my classical ballet practice. Through dance I learned about the seduction of movement, the transformation of the body and the ‘evolution’ of shape. Those years taught me how to shift shape and were the birth of my interest in fashion. I Don’t think of fashion as being clothes, or a discipline. I think of it being much more. 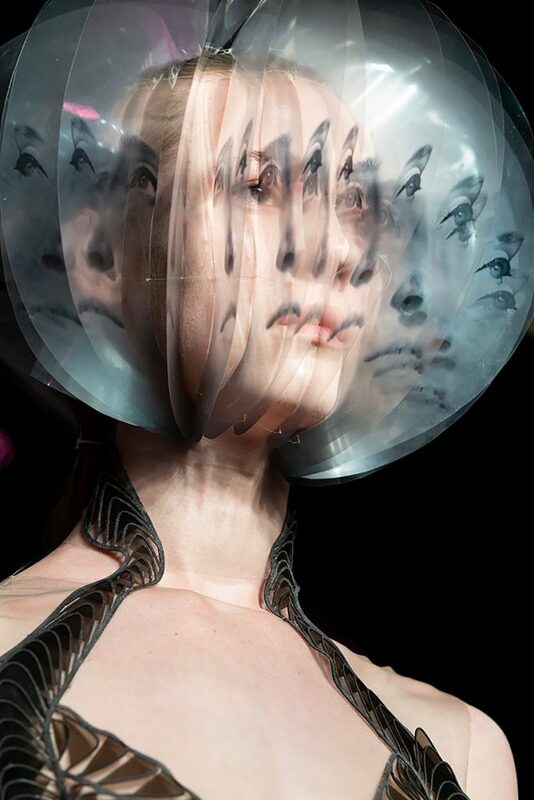 I see fashion as a dialogue between our inside and our outside. For me fashion is a form of art that is close related to me and my body. I see it as a very personal expression of identity combined with desire, mood and culture. Looking around me, I consider what I can’t see as much as what I can see, and that transformative focus creates freedom in my work. 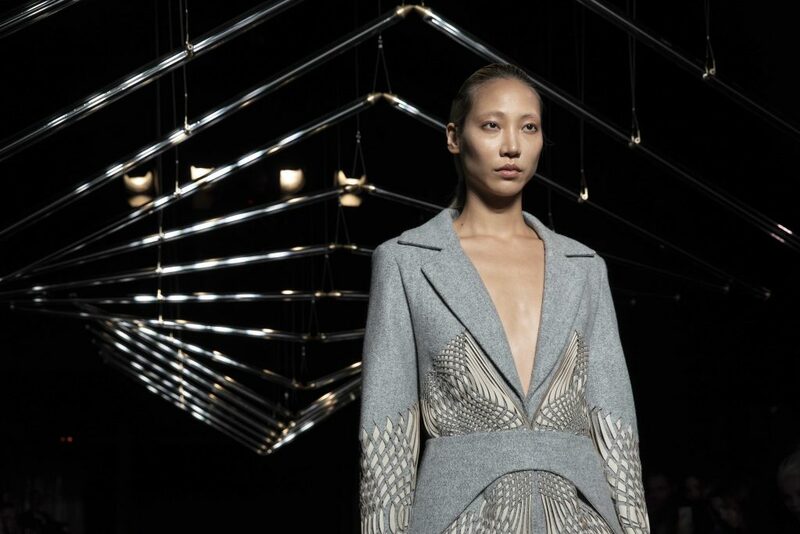 Each garment and every collection is an embodiment to new understanding and discovery, on conceptual level, on the level of materiality and on the level of femininity. Its my search to new forms of femininity through organic silhouettes, delicate craftsmanship, innovation and the collaboration with other artists, architects and scientists. This entry was posted in EXHIBITIONS, FASHION and tagged Haute Couture, Lonneke Gordijn, Ralph Nauta, Studio Drift, SYNTOPIA, van Herpen. Bookmark the permalink.